It’s been a long time since my last post to this site. For those who know me, you know that I am in the process of a change within my career. As I make the transition from one coast to the other, I wanted to revisit and update the blog with something current. A big reason why I haven’t been posting as consistently as I would like to is because I’ve been working on something else when time permits. 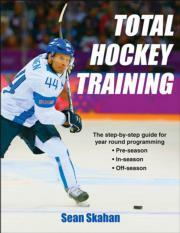 One of my goals has always been to write a book on training for hockey. Well, it is now starting to become a reality. I also want to clean the dust off this blog and start posting again. Total Hockey Training is due to be released by Human Kinetics in February 2016. To say that I am excited is an understatement. I really enjoy the grind of writing and re-writing as we go along until the finish. It will be available both as paperback and e-book. I wanted to share a post that was written by my friend/mentor Mike Boyle on his blog StrengthCoachblog.com. Mike has been posting really good content in regards to his thoughts against year-round specialization in youth sports. I think it’s important to help spread the message all over North America- including here in Southern California. It just seems that the more that I read what Mike has been sharing along with the fact that I continually speak to professional players about what additional sports they played as youths- the more I am convinced. A multi-sport approach as a kid is beneficial in the long run when/if they decide to specialize on 1 sport. For the record, I have spoken to only a few hockey players who didn’t play any other sports. Most “put the bag away” at the end of their hockey seasons. Personally, in the past I have been guilty of putting my oldest son through the the concept of year-round hockey. Whether it was spring selects or in-house hockey, more games were being played after a 7-month season. (Yes- 7 months at age 8). This spring/summer, after a few weeks off, he will be playing lacrosse while also still skating 1-2 times per week in non-competitive situations and competing in 2 weekend tournaments in May. Probably not a complete off-season, but a drastic change from the past. I hope everyone is doing great! As we enter October, hockey season is in pre-season mode or in some cases; in-season mode is already taking place. Either way, you got to love this time of year. On the forum, we have had some good discussions ongoing such as a discussion on training 8-10 year olds and some of the recent articles written about today’s off-season training done by some of today’s NHL players. What is great about the forum is that there are always good questions and discussions about all different kinds of topics in regards to performance training for hockey. Make sure you check out the forum when you log on. Remember, if you are not a current member, you can try us out for $1 for 7 days. If you don’t like it, you can cancel during that time. 2012 was a good year at SeanSkahan.com. I made an effort to improve my content by focusing on the quality of my writing. Although I think I can improve greatly, I am happy with how far I have come since I started this site. I was able to increase the number of views to the site by 35% from 2011. Not too bad, but I can still try to improve the total number. All being said I thank you very much for stopping by. I hope to continue to post more frequently with better content in 2013. I realize that I am a week late for Cyber Monday. However, I just wanted to let everyone know that I lowered the price of my DVD’s- Kettlebell Lifting For Hockey and Slideboard Training For Hockey by 20%. I thought that the title of the post was appropriate because I guess I would consider myself to be a beginner still in the whole information product marketing world. I’ve always seen myself as a Strength and Conditioning Coach who made the DVDs because I believe in the content and I strongly believe that it can help any hockey player and/or coach. However, the reality is that not that many people are talking about them on-line. I now get the power of marketing and the impact of more people talking about your products. All I can do is appreciate the learning experience that this has provided me with. I do promise to get the word out more when I do complete my book which is now 40,000 words and 150 pages deep. I find myself at the stage where I am updating more of the content as I learn more. Anyways, for now, Kettlebell Lifting For Hockey and Slideboard Training For Hockey are both for sale here. The title of this post includes “Re-visit” because I attempted to write about how I was using the Functional Movement Screen (FMS) back in 2004 or 2005. At the time, I was using the FMS with my team in a different manner than how I am now. Although I was screening each member of the team, I wasn’t clear on what to do with the scores. I tried to correct different parts of the screen by incorporating corrective exercises within the team’s strength training sessions. For example, if a player had scored a “2” on the Deep Squat, then they would perform a corrective exercise such as the Toe Touch with Alternating Arm Reach to Stand in between sets of a strength training exercise. For example, they would perform a set of an exercise such as the Hang Clean and then proceed to do a corrective exercise before their next set. We would also insert other corrective exercises which were specific to other parts of their screen into other parts of the team strength training session. While I am not saying that this was the wrong approach, or that any other way to use the FMS and correctives is wrong, it was really difficult to implement this method. One, I have 20-25 players on the team. Trying to individualize FMS scores into the team training program this way was time consuming and not logistically efficient. Second, I thought that each player should be able to get a total score of 21. As a result, I would look at the scores and then try to correct each pattern going from top to bottom in the order of how the screen is conducted. This would put the Deep Squat first, followed by Hurdle Step, In-Line Lunge, Shoulder Mobility, Active Straight Leg Raise, Trunk Stability Push Up, and Rotary Stability. Fast forward 8 years, and the reality is that I still don’t have a comprehensive system for using the FMS and its accompanying corrective exercises. However, there have been many screens and correctives done since. In reality, what it came down to was that even though I was using the screen, the screens weren’t actually getting better. Whether that was taking a part of the screen from a “2” to a “3”, or getting symmetrical “2’s” instead of “1-3”, we weren’t seeing it happen. What could I do better? It certainly wasn’t from a lack of learning. I’ve attended the FMS course, I’ve purchased all of the “Secret” DVD’s, I’ve seen Gray Cook speak several times, and I’ve read Movement (1). It wasn’t until I attended the CK-FMS course which is a 4-day FMS course that is held in conjunction with RKC community, that I really felt like I got it. What I learned during the course is that there is a system for interpreting FMS scores and a protocol for corrective exercise strategies. What the system does is give a hierarchy of which parts of the FMS to address according to the scores. I also learned that the system of using correctives doesn’t start with the Deep Squat. It starts by looking at the Active Straight Leg Raise. It turns out that the Deep Squat is screened first because it is easier to administer the standing parts of the screen first when screening somebody. In my opinion, the FMS is now easier to implement. The number one priority is to identify the weakest link. In order to do this, we follow the FMS algorithm and identify what is the most important part of the screen to address first. When we prioritize the one weak link, we are going to spend more time on correcting that part of the screen. In my opinion, this is better than the approach in which we may prescribe 1 corrective exercise for each of the 7 parts of the screen. If we spent the same amount of time that we would spend on using the shotgun approach just on the weakest part of the screen, we will have a better chance of making positive changes. Once we have screened the player and have identified the weakest link, he will then be put into a specific corrective exercise group. We categorize our corrective groups according to what part of the screen is the weakest link. These groups will start their training sessions immediately with the proper progressions and exercises before participating in the team training session. We actually did this during the off-season by screening 34 players at our prospect conditioning camp. What was interesting was that other than 3 individuals, each player was identified as either an Active Straight Leg Raise or a Shoulder Mobility (the others were 2 Trunk Stability Push Up and 1 Rotary Stability). In our team training sessions, we will always start with soft tissue work. We have always done that with foam rollers, tennis balls, and the stick. However, in addition to what some of our players may do for general foam rolling, we will now address specific areas. For example, in our Shoulder Mobility group, we would spend more time on the internal rotators of the shoulder joint, posterior shoulder, upper back, and the serratus. Our Active Straight Leg Raise players will spend more time with their hamstrings, glutes, calves, hip rotators, and hip flexors. After we foam roll, we will then move on to breathing. When I first started reading about the concepts of breathing, specifically diaphragmatic breathing, or crocodile breathing, I must admit that I completely disregarded it. Why would I spend any time teaching our players how to breathe through their diaphragm? There will be no time when the athletes that I work with will remember to breathe through their stomach when they are competing. Also, breathing is part of the autonomic nervous system, so how would we be able to consciously think about breathing like this during competition or under any stress? It looked like a complete waste of time and not something that I would do with my athletes. What changed? I tried it in the context of the FMS corrective exercise strategies. I measured my shoulder mobility which has been a 2 left, 1 right for some time. I then proceeded to do 20 crocodile breaths and then re-assessed. I had an immediate positive change when I re-screened. I also used it with several athletes who saw positive changes in not only shoulder mobility, but other parts of the screen as well. It works- period. I probably can’t tell you why or how this works, but getting into a relaxed state by triggering the parasympathetic nervous system has something to do with it. There are other professionals who could tell you why and how more specifically. However, whether it is yin/yang, sympathetic/parasympathic,or tension/relaxation, there is something beneficial of getting into the slower and relaxed state by breathing through the abdominal area versus the chest. The question is now, who needs to add diaphragmatic breathing and how are we going to coach it? When diaphragmatic breathing is combined with soft tissue work and corrective exercises, you can see positive changes happening- especially to the Active Straight Leg Raise and Shoulder Mobility. It is important to note that for us and for the best usage of time, we will find the one corrective exercise that will help make a positive change. A positive change would be a correction in the FMS score or maybe a gain of a few inches. With the ASLR, we will either do Band Leg Lowering or Band Leg Lowering with Core Engagement. This would depend on which exercise makes the positive change. With Shoulder Mobility asymmetries, we will go right into to the Rib Grab. Before we coach our players on Rib Grabs, we must emphasize to them what the proper side lying position is. What is interesting about Rib Grabs is at the starting position, there appears to be rotation at the lumbar spine versus the thoracic spine which is what we are trying to improve. The key to prevent this is to keep the knees above 90 degrees. This has been very helpful in making sure that we are not getting any lumbar rotation. What has worked well with Rotary Stability is rolling. If we identify someone with an asymmetry in the Rotary Stability, we go right into assessing their rolling ability/inability. We will use rolling as an assessment of how the athlete rolls without the use of the lower body and lower body extremities. We will look at 8 different quadrants while watching them. We will be looking for their ability to roll from prone to supine upper body only left and right, prone to supine lower body only left and right, and then supine to prone upper body only left and right, and supine to prone lower body left and right. We will simply ask them to imagine that they are paralyzed from the waist down in our upper assessments and then paralyzed from the waist up in the lower body assessments. Like the actual FMS, when we are assessing the athletes’ rolling, we are looking for their weakest link. What position are they unable to roll to/from? Where do they get stuck? After we know this, we will simply get them to correct that part of their rolling ability. This will help improve the Rotary Stability. An important aspect about the TSPU part of the screen that I have seen is that there might not be as many immediate changes from the corrective strategy perspective. For Trunk Stability Push Up corrective strategies, we have been successful at using basic push up position progressions. Before we get into push up progressions, we will always start with the plank. We like the RKC version of the plank where our elbows are slightly ahead of the shoulders, the feet are squeezed together, and we are asking the player to contract all of the muscles in his body to make him as stable as possible. As we get better at planking, we will incorporate push up position holds and then increase the volume of Push Ups. The FMS can give us a map of where not to go or what not to do in our training. Gray Cook is known for saying “Don’t put fitness on top of Dysfunction”. There is a system as to how to determine what are exercises are appropriate/inappropriate according to FMS results. The CK-FMS community would refer to this as “Red-Lighting”, “Yellow Lighting”, or “Green Lighting”. The FMS can tell you which strength training movements should not be done (red), proceed with caution (yellow), or proceed (green). For example, athletes with “1’s” in the SM, should stay away from any overhead pressing. Those with “1’s” in ASLR should stay away from exercises such as Kettlebell Swings, Deadlifts, and Double Leg Squatting. I must admit, when I first learned this system, I originally thought it may be too much on the cautious side of things. We keep it simple by not allowing anyone in the shoulder mobility group with 1’s to overhead press with kettlebells, dumbbells, or the barbell until we have a minimum of symmetrical 2’s. With the ASLR group, we won’t do Swings or Front Squats with those who have 1’s. Not until their screens are a minimum of symmetrical 2’s. When we think about the time spent on everything above, we are talking about 5 minutes of soft tissue work and 5 minutes of breathing and correctives. Then we proceed with our team warm up. For the most part, these 10 minutes and then making the necessary adjustments for contraindicated exercises are when we are really individualizing our program. (1) Cook, G. (2010). Movement. Aptos, CA: On Target Publications.